Convenience is included With the nox sideboards, you can choose between room divider sideboards and sideboards with sliding doors or drawers. The sliding doors are available in natural wood or palladium glass. One particularly convenient feature is that the glass sliding doors can be pushed aside completely. The nox sideboards with drawers are available in natural wood, including wild oak and wild walnut. They can optionally be fitted with inside drawers and silverware inserts. 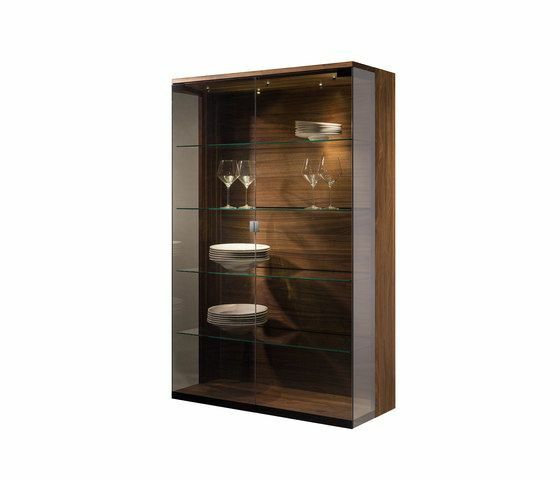 nox display cabinets are available with clear or palladium glass doors. The fittings used on the glass doors of the nox display cabinet are totally invisible and highly intelligent. The hinges are cushioned and allow the door to be precisely adjusted in all three directions. The integrated drawer appears to float: the fittings are ""hidden"" by the side and front parts. All that remains is the elegant aura of the natural wood. In nox accessory parts with palladium glass front, the specifically targeted LED lighting highlights the presented items as if on stage.